California regulators have failed to order cleanup or take other legally binding enforcement action on more than 90 percent of the thousands of underground fuel storage tanks known to be leaking toxic chemicals into water and soil throughout the state, although many of the leaks were first reported more than 10 years ago, according to an Environmental Working Group (EWG) computer-assisted investigation. Even when cleanup was ordered, regulators almost never fined even the biggest polluters. The state continues to respond reactively, waiting for problems instead of heading them off. Gov. Davis has ordered a phaseout by the end of 2002 of the gasoline additive MTBE, a possible human carcinogen that contaminates an estimated 10,000 leaking tank sites statewide and has forced the closure of drinking water wells in Santa Monica, Lake Tahoe, Sacramento, Santa Clara and Kern County. But the great majority of leaking tanks, containing an array of known carcinogens and other toxic chemicals that could pose a greater threat than MTBE, go on polluting water and soil without action by the state water board, regional water boards or state health department. 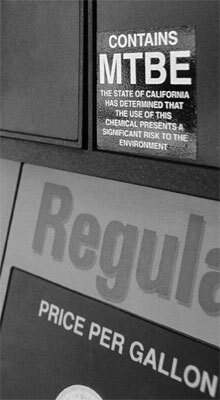 Petroleum products account for almost all toxins leaking from underground tanks, and in California 14 large oil companies are responsible for more than a third of the open cases where leaking tanks contaminate water. These same 14 companies have received more than $180 million in reimbursements from a state cleanup account funded by fees paid by all owners of underground tanks. These fees are passed on to consumers as higher gasoline prices, meaning the public indirectly pays for cleaning up the companies’ leaks. Although most underground tanks in California have now been upgraded, state and local regulators have found that the new tanks also often leak and their leak detection systems often don’t work. (SWRCB 1999b, Santa Clara County 2000.) Unless state regulators take aggressive steps to identify and contain all leaks, adopt a comprehensive and reliable monitoring program to catch leaks before they spread to water supplies, act swiftly to order cleanup of contaminated sites, practice rigorous enforcement to deter future contamination, and hold the producers of the contaminants responsible, the threat from California’s leaking underground storage tanks will grow worse. Since 1970 about 36,000 leaking underground tanks have been reported statewide, but 36.3 percent of the case records in the state’s database provide no enforcement information at all. About 15,000 of the open and closed leak sites affect water, and about 18,000 affect soil. Binding enforcement action was taken in about 12 percent of water cases, compared to 5 percent of soil cases. While contaminated water is clearly of high priority, chemical plumes in soil can spread hundreds of feet in only a few years to nearby wells and aquifers. MTBE not only migrates through soil unusually rapidly but accelerates the spread of other chemicals that also leak from underground fuel tanks, including benzene, a known human carcinogen, and tolulene, a known human reproductive toxin. Underground storage tanks are leaking toxic chemicals into water and soil in every county in California, but levels of enforcement vary widely by region. Sixty-three percent of all open cases in San Jose were first reported at least 10 years ago, but only 32 percent of Los Angeles cases are that old. Of cases involving major oil companies, no enforcement action was taken 79.4 percent of the time, informal action in 12.8 percent and binding enforcement action in 7.8 percent. Since 1970, only seven oil company cases have resulted in fines or other punitive action. More than 40 percent of state records on leaking tank cases involving major oil companies provide no enforcement information at all. As the 1999 Joint Legislative Audit Committee report concurs, criminal penalties should be applied when a tank owner or operator allows a leaking underground storage tank to contaminate drinking water. The state should develop an aggressive statewide enforcement plan built on the assumption that any tank leak or spill is unacceptable, and must be cleaned up as soon as possible to prevent further contamination. The state should fine or otherwise penalize owners whose tanks leak, those who fail to report leaks promptly, and those who fail to perform required cleanup. The severity of the penalties should take into account the company’s size and statewide extent of its pollution. Penalties should increase for repeat offenses. The state water board, regional boards and local agencies must follow through to enforce cleanup and containment orders promptly. To prevent fraud, regulators should step up inspection of upgraded sites and no longer allow companies to "self-certify" their own compliance with upgrade requirements.